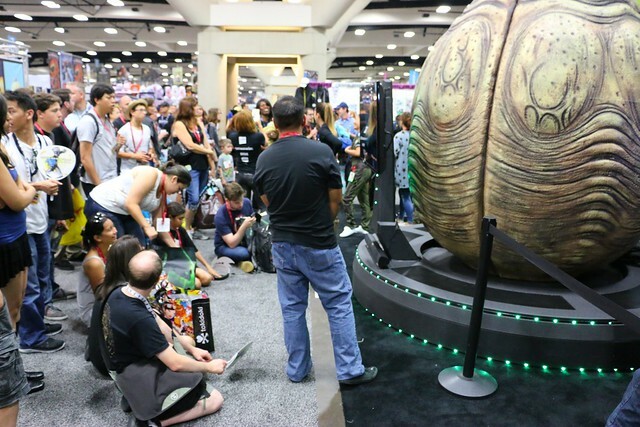 The experiences at San Diego Comic-Con in recent years have evolved to include much more than celebrity encounters and seeking out collectibles. 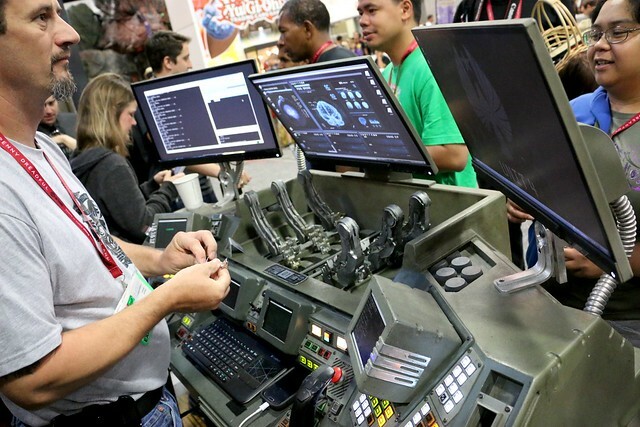 Theme park quality entertainment has found its way to the convention, both in popular booths on the show floor as well as offsite entertainment. And just like in a theme park, each of these unique experiences had extremely long lines to enter. 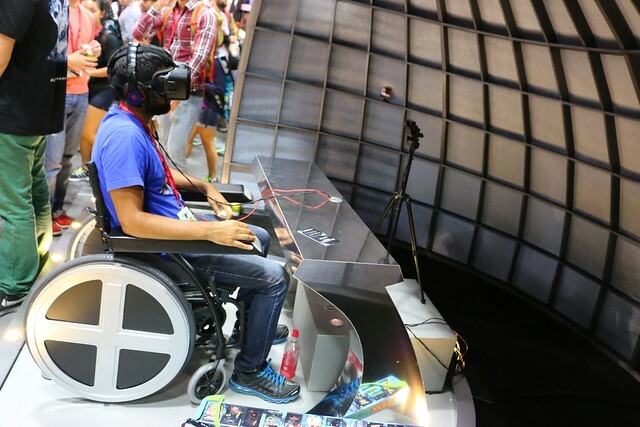 Among the most popular forms of themed experiences at SDCC 2014 was the use of virtual reality (VR), returning to the limelight in a big way courtesy of Oculus Rift technology. This lightweight, high resolution, 3D headset creates smoother, richer, and more believable virtual imagery than any widespread VR system in the past. 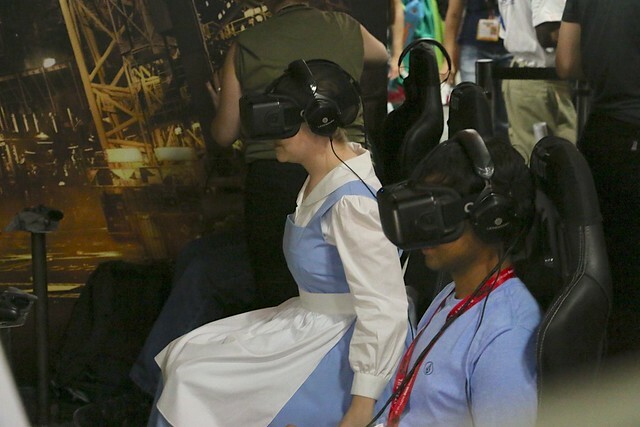 Comic-Con afforded many opportunities to get hands-on with the Oculus Rift in experiences promoting movies and TV shows. 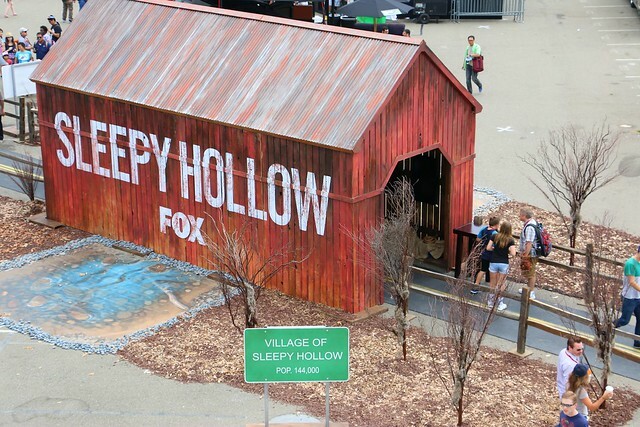 In the Petco Park Interactive Zone just outside the San Diego convention center, Fox set up an experienced based on the TV show “Sleepy Hollow,” set inside the tale’s famed covered bridge. 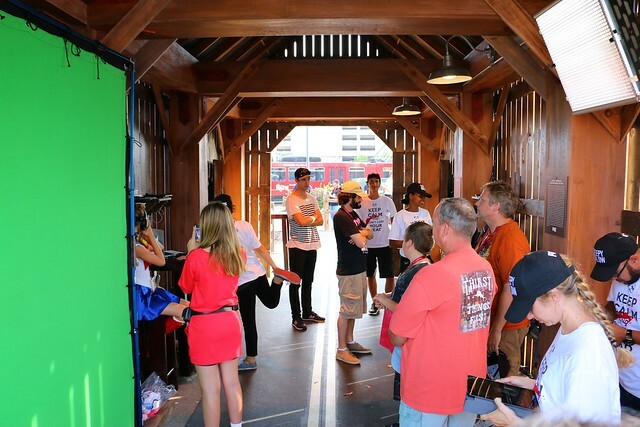 With headless horsemen characters wandering around outside, attendees had the chance to step into the world of Icabod Crane in an eerie virtual experience hosted by actor Tom Mison, in character. 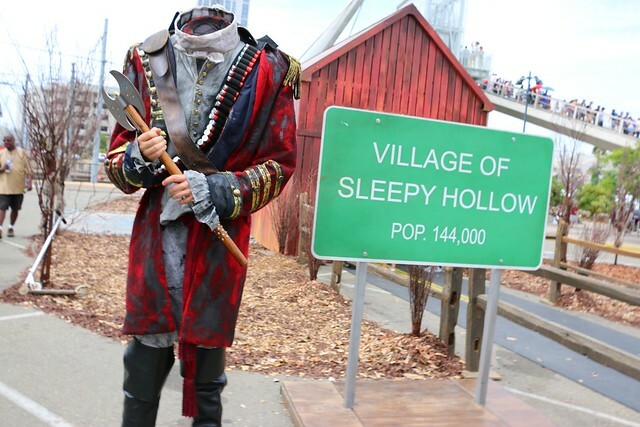 The short 1.5 minute experience gave everyone a good scare by immersing them in an experience in a graveyard, being stalked and ultimately beheaded by the headless horseman. 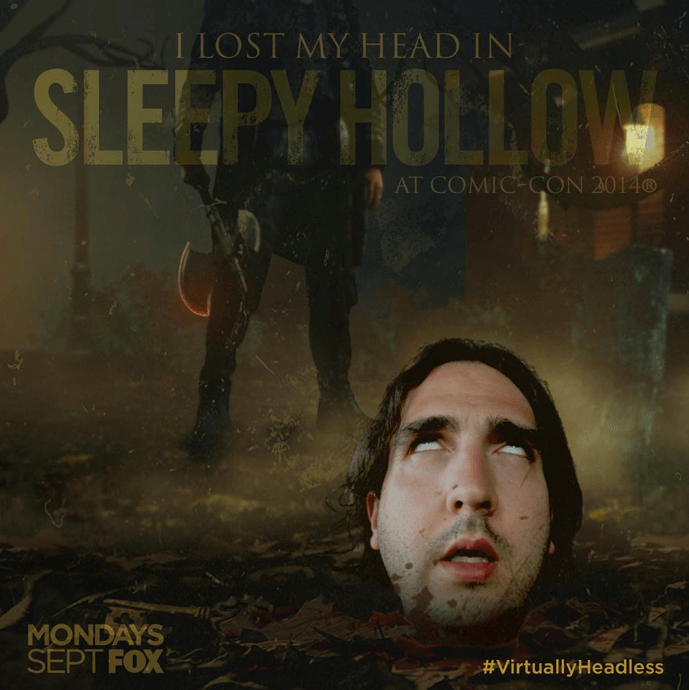 The Oculus Rift system combined with surround stereo headphones created a wonderful overall experience that served equally to entertain and promote the TV show. Once strapped in, the real world disappears, replaced by a lifelike virtual one. Head movements are perfectly tracked using the VR system, with 360-degree 3D visuals playing out. It’s convincing enough to cause many people to flinch and react to startles as if they were really happening around them. And everyone left with a photo op souvenir, e-mailed and/or tweeted to them. It was a bit gruesome of an encounter, but fun nonetheless. 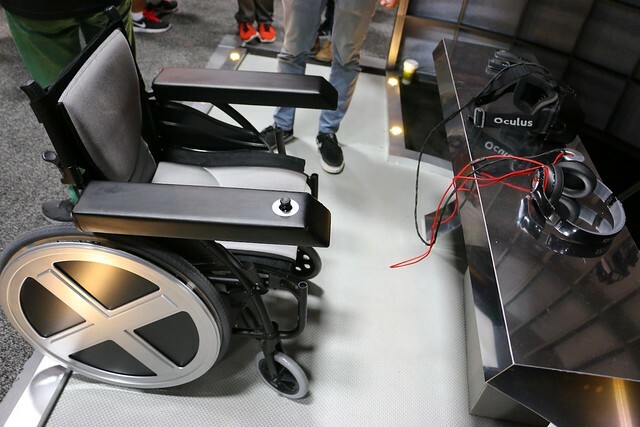 Another impressive use of the Oculus Rift VR system allowed X-Men fans to embody Professor X by actually sitting in his wheelchair and virtually entering Cerebro on the hunt for Mystique around San Diego. 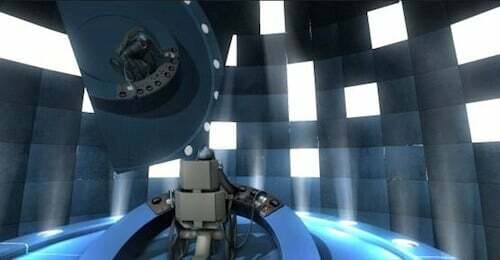 This 3-minute, 360-degree 3D experience was more interactive than the “Sleepy Hollow” one, containing hand controls for moving the wheelchair forward. After strapping on the headset, looking straight down produced an incredibly bizarre out-of-body feeling, as Professor X’s body was there instead of one’s own. As his voice guided users to look around, actual SDCC cosplayers and attendees appeared, recorded especially for this experience. 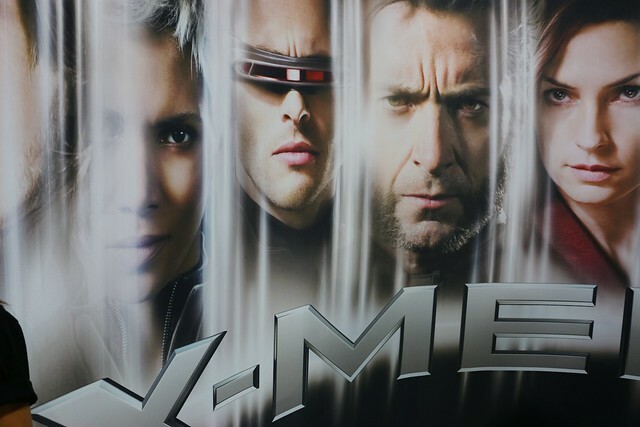 After looking “past” the immediate surroundings, Professor X honed in his mental powers to finally find Mystique, dispatching the X-Men after her. 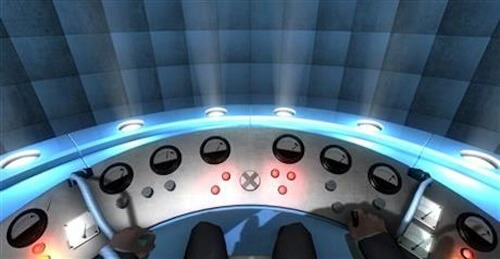 To sit down into the body of a famous fictional character is an incredibly intriguing use of the Oculus Rift, the potential of which could be endless for theme parks and other special events to allow guests to not just meet their favorite characters but actually virtually become them for a while, even taking on their special abilities. 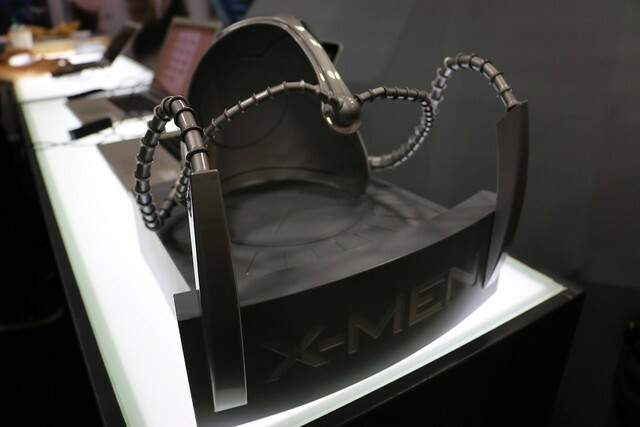 This experience was promoting the upcoming collector’s edition release of X-Men: Days of Future Past, which comes in a special case resembling Professor X’s helmet. 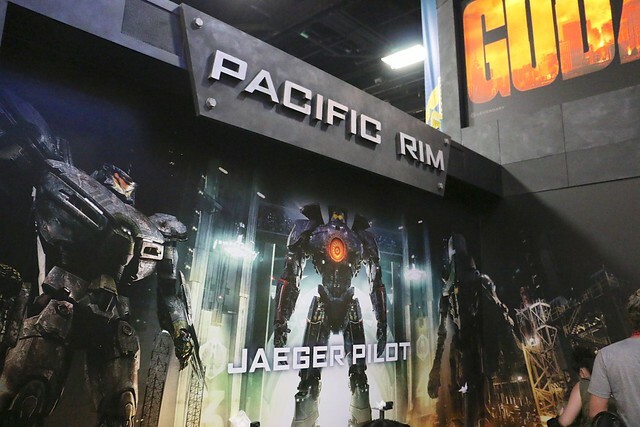 But the most impressive Oculus Rift experience at Comic-Con 2014 was in the Legendary Pictures booth, enabling attendees to become a Jaeger Pilot from Guillermo Del Toro’s “Pacific Rim.” This VR experience was so popular that return tickets disappeared within a matter of minutes at the beginning of each day, filling up time slots for the whole day. The loud, explosion filled 360-degree visuals were everything a VR experience should be. Immediately upon wearing the headset, attendees felt like they just stepped into the pilot’s chair of a 250-foot tall robot. 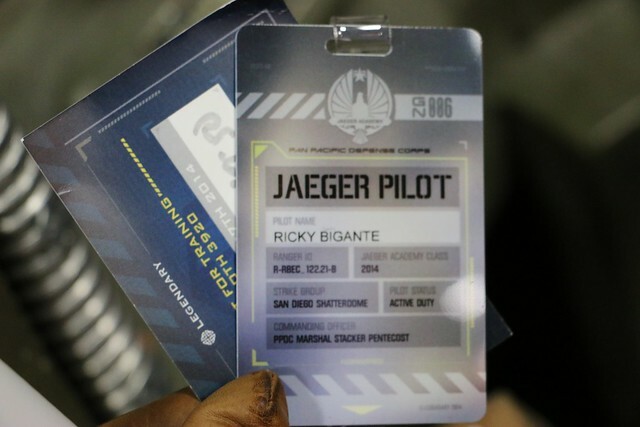 Using film assets from Industrial Light & Magic, this Pacific Rim: Jaeger Pilot experience began with a short conversation with a fellow pilot by looking to the right while completely immersed in the cockpit environment. But the first-person battle quickly ensued between Gipsy Danger and Knifehead, resulting in explosions, shrapnel, and all-around carnage. It was thrilling and exciting in every way virtual reality can be, showcasing the potential for this medium in the future. While “Sleepy Hollow” was eerie and the “X-Men” Cerebro experience was clever, this “Pacific Rim” VR experience was the equivalent of a full-fledged theme park ride, all contained within a headset and headphones. 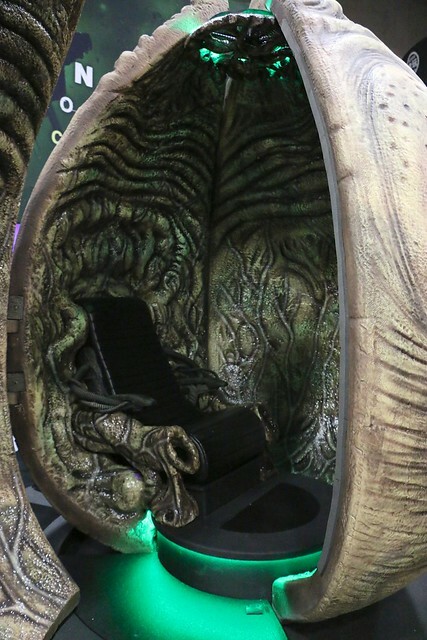 Sega presented a different sort of immersive experience on the SDCC 2014 show floor promoting their upcoming video game Alien: Isolation. 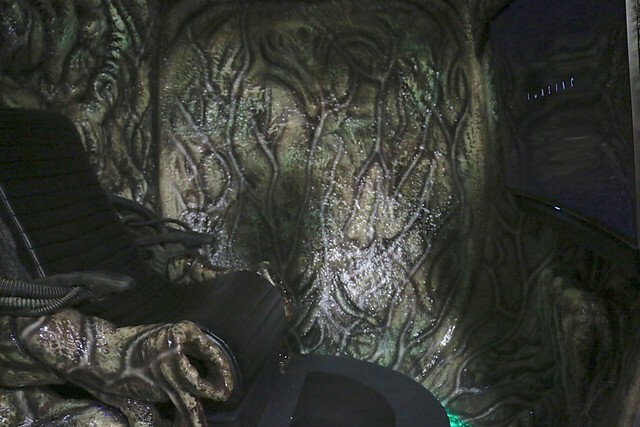 It wasn’t an Oculus Rift simulation, but it did prove how important a themed environment is to an experience. Playing a survival horror game on a brightly-lit show floor is fun, but playing it alone inside a confined space with creepy lighting, a rumbling seat, and cranked up audio really elevates the gaming experience. 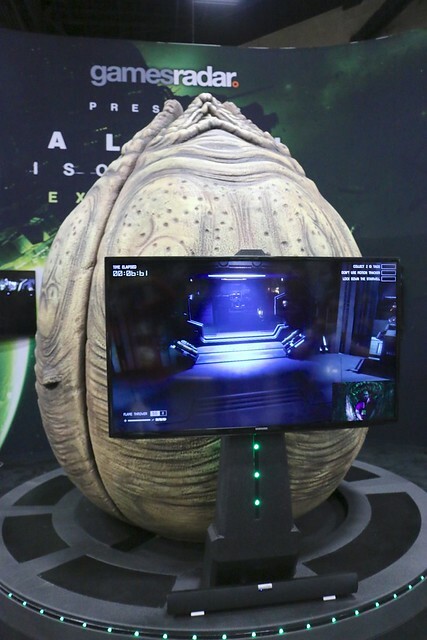 Stepping inside the giant “Alien” egg, SDCC attendees were immediately enclosed and thrust into the suspenseful new game, being hunted by a Xenomorph. The goal was to survive as long as possible, but most players didn’t make it very long. Though this experience was essentially a glorified video game demo, it felt like much more than that with all the multi-sensory elements combined, offering promise for interactive screen-based entertainment in the future when surrounded by the right combination of effects. While theme parks continue to build the biggest, fastest, and most thrilling rides, the use of 3D projected visuals are an increasingly large trend. 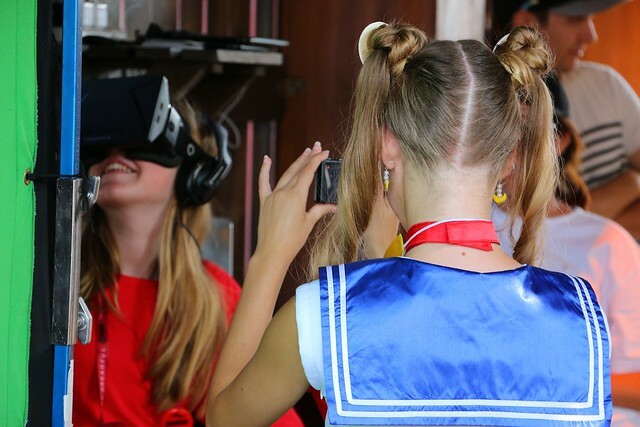 The virtual experiences shown at San Diego Comic-Con prove that in an extremely small space, many of those same thrills of a theme park can be duplicated through virtual means. But the technology isn’t quite there yet to replace real life. 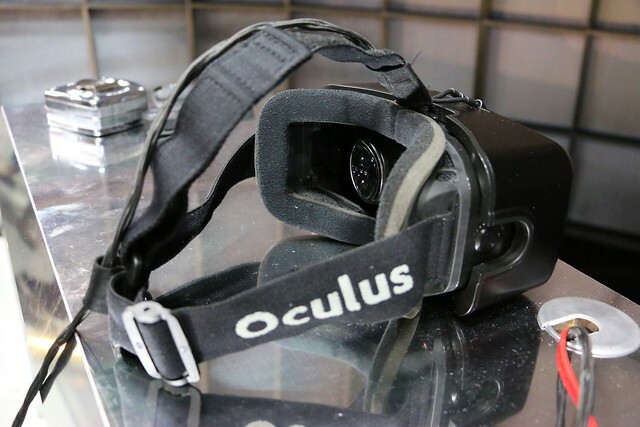 Oculus Rift is a great VR system, but leaves something to be desired. While visuals are high-definition, they appear somewhat pixelated, with a “screen door” effect preventing them from truly feeling real. The head tracking motion is incredibly spot-on, as is the audio that follows. But peripheral vision is severely limited as well. 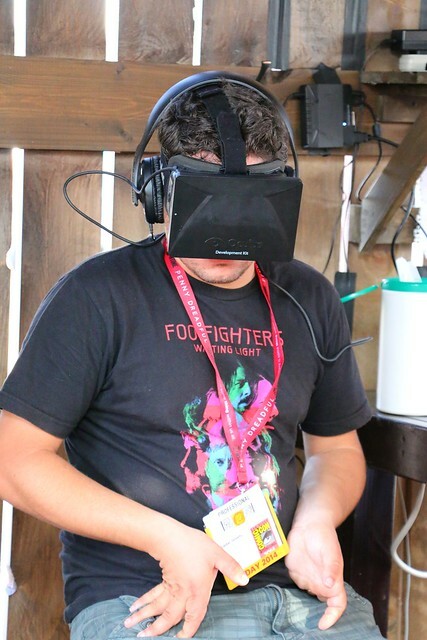 Virtual reality has been around for years and will continue to evolve and improve. Oculus Rift is among the best ever developed, particularly for its small, lightweight form factor, and as long as the medium is prepared well, it’s absolutely a must-try to see what the future of themed entertainment holds. Introducing the all-new Inside the Magic web site! Founder of Inside the Magic. Since growing up in Miami, Florida and ultimately moving to Orlando after college, Ricky has become an expert on Central Florida's many theme parks and attractions. He founded Inside the Magic in 2005.